We’ve been getting itchy feet about going on holiday as it’s been quite a while. I’m such an avid traveller that having such a big break between trips actually made me extra excited about this one. I took full advantage of a week away from social media, only responding to messages from friends and family. It really helped. We all know the accounts that are filled with sunny beaches and feet by the pool whilst we are hitting the daily grind, no one needs that in their life. So instead, here’s just a quick summary of our trip with all the foodie highlights. We arrived to the longest immigration queue I’ve ever seen, about an hour and twenty minutes to get through but once we finally got out of the airport the sun was setting which was stunning. A short cab ride later we arrived at the beautiful Riad Nashira, where we were staying for three nights. 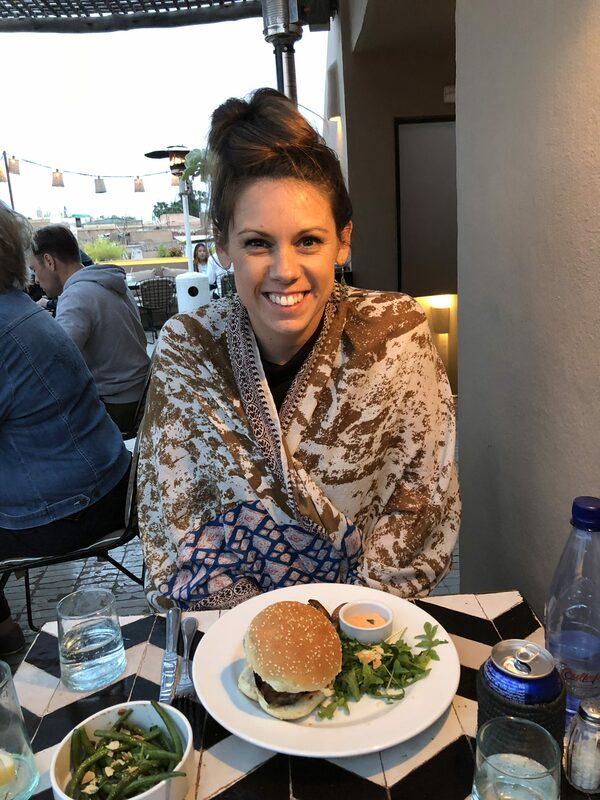 We were tired but instead of chilling at the riad we opted for their restaurant recommendation and went to a cute little Italian/Moroccan fusion restaurant. When you arrive in Marrakech most hotels recommend a guide take you for your first few trips as the medina of Marrakech can be quite daunting, and very easy to get lost in. We arrived at what looked like a door in the wall but once inside it opened up into the beautiful space with trees and mismatched furniture. 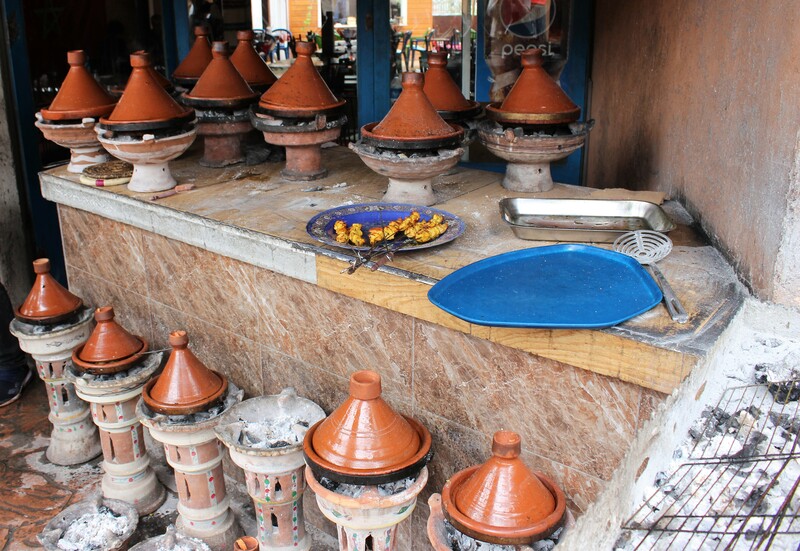 We both opted for tagines, one lamb, one chicken. The couscous that arrived with it, I simply cannot even explain how good it was. Pretty sure it had butter added to it as it a rich yellow colour and the flavour was absolutely divine. The lamb was soft and fell apart as I ate it, and the dried fruit gave an added depth of sweetness. Sunday. Breakfast at Riad Nashira was brilliant. So much to choose from, I didn’t know where to start. Fresh fruit, eggs, bread, quiche, salad, coffee, tea and juice, basically everything, a little bit like a buffet. Weirdly the Moroccans love cake at breakfast time, we didn’t add that into our feast. We then went out exploring, the hotel guide showed us how to get to the medina. All the little alleyways and streets look exactly the same so it’s easy to see how people get lost. 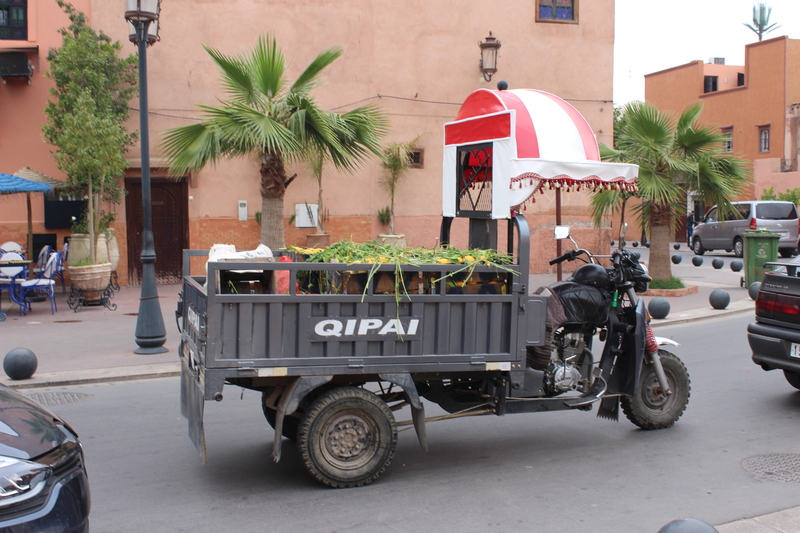 We sampled our first mint tea in the Kasbah district. The sugar is insane and was unexpected. In Morocco they also pour mint tea from a height so that it forms a foam on the surface. Note: ask for it without any sugar, we also skipped lunch. We then visited the secret gardens of Marrakech. We were pretty tired on our return so headed to Café Arabe which is perfect for drinks with a view but the food was average. We fancied going for a glass of wine which is why we opted for this location, reviews were mixed but sometimes you’ve just gotta go with it. Being a Muslim country alcohol isn’t routinely served, many restaurants and hotels do have a licence though. Monday. An all day trip to Ouzoud Falls, three hours each way, took up most of the day. 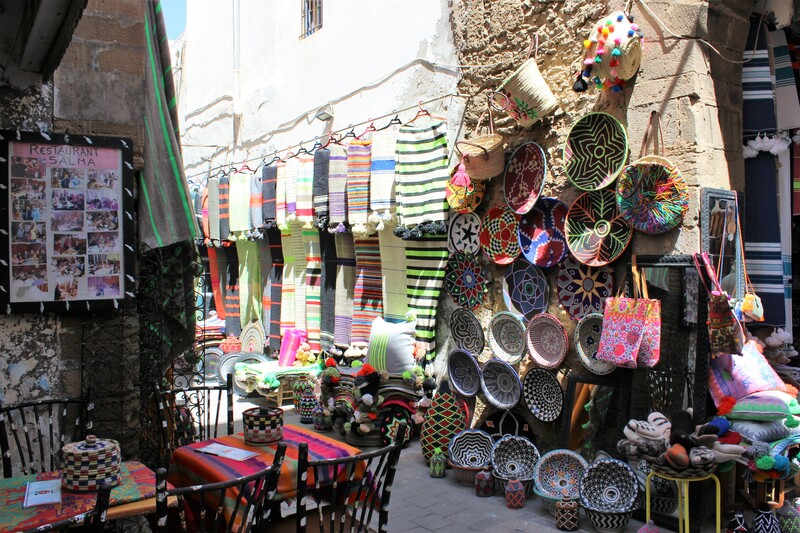 This is a trip I would recommend to anyone, we also ate more tagines, couscous and Khobz (this is the handmade bread which is sold by street vendors and in restaurant they supply by the bucketload to your table). It has a crisp crust but is soft in the middle, it can be made with any type of flour. Dinner was at Nomad. We had tried to get in here for lunch the day before but it was fully booked. Despite it being freezing, even though they had patio heaters, the sunset was gorgeous and the food very tasty. I opted for the Moroccan spiced lamb burger, we had a side of green beans which were crunchy, garlicky and I finished the entire bowl! Nomad is just around the corner form the spice quarter, and that’s one thing about Morocco that is inspiring, their use of spices gives so much flavour. 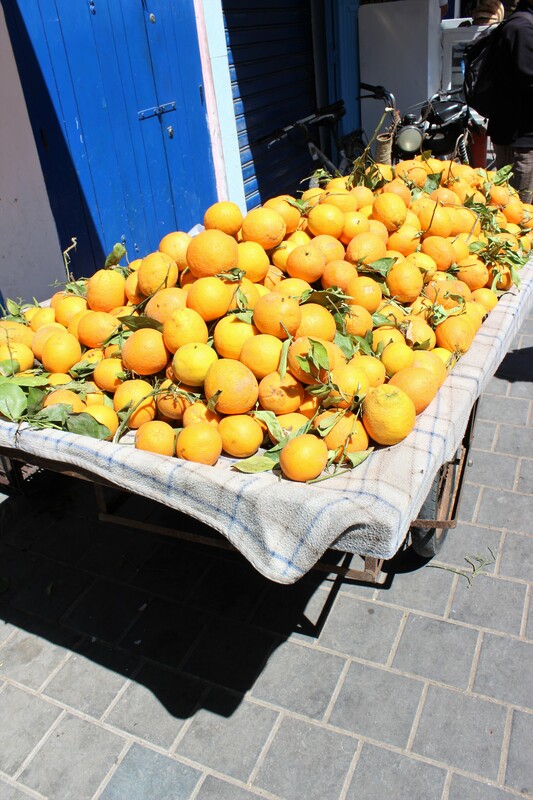 Tuesday: a 3 hour bike tour around the city with an orange juice stop in the square while we watched the henna ladies and snake charmers, followed by shopping in the souks. Bartered and got a gorgeous Moroccan rug. We lunched at Le Jardin, (by the same owner as Nomad). 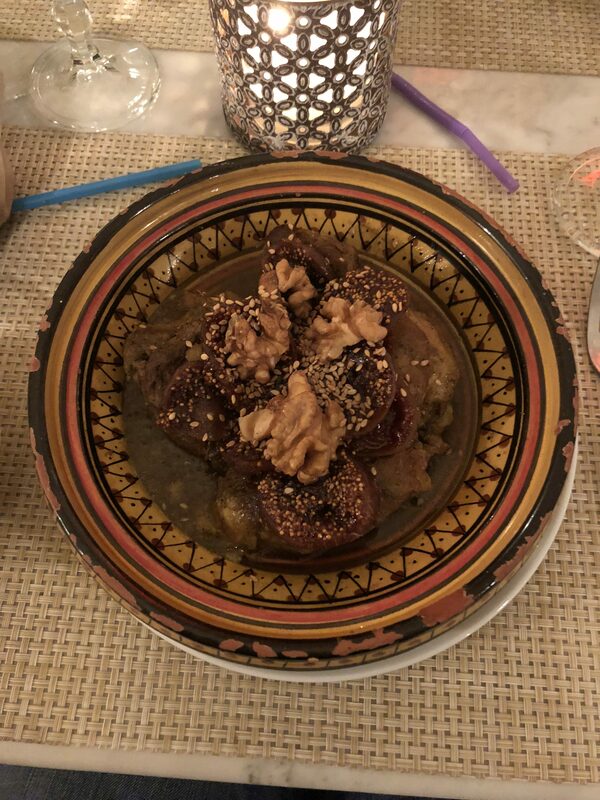 The kefta tagine had been on my list of foods to try, minced beef with eggs, a bit like shakshouka but with meat instead of veggies, also with couscous. What’s very prevalent is fruit juice. There are markets stall selling it everywhere, its automatically poured at breakfast and is on every restaurant menu. It’s no surprise with alcohol not being served, but I couldn’t help to think about all the sugar. And also meat, there is lots of meat, be very prepared for that. And for for everyone trying to sell you everything, takes a few days to get used to. Mint tea, lamb tagine, lamb burger at Nomad, kefta tagine, and bike tour with a pit stop for juice! More to come on our next stop in the beach side haven of Essauira soon…..